A 'Daphne' relative with yellow and white, very fragrant flowers appearing in golf-ball sized clusters at the ends of the branches. 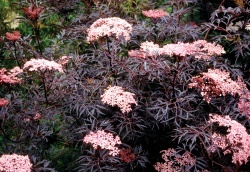 Blooms in very early spring before the leaves; tolerates shade but not transplanting. Plant anywhere the amazing fragrance will be appreciated. 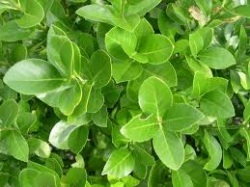 The big, round leaves of this variety are evergreen. The soft green and yellow variegation is striking in the landscape. 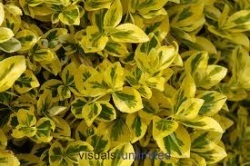 Makes a wonderful small foundation plant or perfect for a colorful container on a patio. 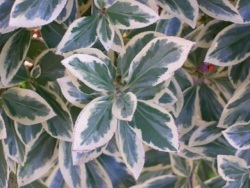 Nice, low-growing evergreen shrub with beautiful, variegated leaves of bright green with cream-colored margins. Perfect for foundations, small shrub borders, and containers.